EndoscopyNow facilitates education for endoscopists through a comprehensive mobile platform. Our up to date feed and content library showcase the latest literature, procedural techniques and news relevant to medical professionals. EndoscopyNow provides a one-stop shop for gastroenterologists to stay in tune with the latest research, procedural techniques, and news. 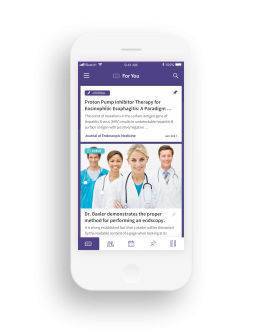 Stay up to date with the latest guidelines, research, procedural videos, and news stories personalized to your areas of interest. Easily save content you're interested in for later review. Find Live Training Events - Coming Soon! Use the app to discover and register for live training events. Our continuously refreshed and up-to-date database of articles and videos is at your fingertips. You can search and filter these based on content types and your areas of interest. Educate and engage patients about their conditions and procedures using interactive drawings you create within our app. This DrawMD integration is as simple as choosing a template, annotating with a wide range of stamps, personalizing with text, and then sharing your drawings with your patients via email or print. Want to learn more? Check out our Hot Topics for the latest expert content in endoscopy!